The first meal I made in our new home was one of the most delicious meals I’ve had the pleasure of eating in a long time. It was inspired by a competitive recipe project I was invited to participate in called The Mushroom Masters. I’m representing Team USA’s dinner challenge against Australia and Canada. The recipe? 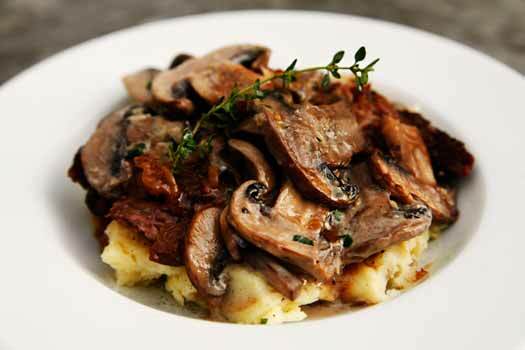 Marsala Mushroom Cream Sauce over Beef Braised Beef and Buttermilk Mashed Potatoes. Hello…. 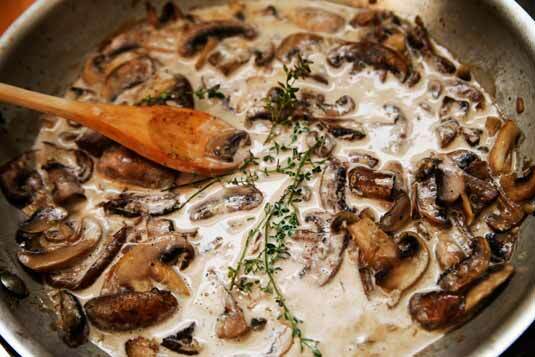 Um, Marsala Mushroom Cream Sauce…. Beef Braised Beef…. and Buttermilk Mashed Potatoes – Glory!! This recipe I developed has become a new family favorite especially since we are experiencing a true Northwest fall season. There is something so divine about sauteed mushrooms in a herbed Marsala cream sauce – which quite honestly I could have eaten by itself. Spoon this decadent sauce over the beef braised beef and buttermilk mashed potatoes and you have a comfort food dish fit for kings. You must really make this, seriously. You can vote for the recipe here at Tastespotting (and yes, please vote if you appreciate this lovely dish) and find more information about this recipe as well as all the other participants. Thank you in advance for your support! 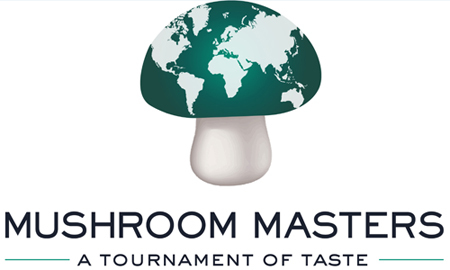 Thanks to The Mushroom Council and Tastespotting for sponsoring this contest. Disclosure: I was compensated to develop this awesome recipe by the sponsors of this contest. stupid question. Sweet or dry Marsala? My husband is a very picky eater…he loved it, and I did too. I’m normally not much of a beef eater, but this looks great! The first meal I made in our new home was one of the most delicious meals I’ve had the pleasure of eating in a long time. Glad you like the recipe. Next time I make this I am going to use noodles like you did! Hi Alice, I’ve been following your blog for a while now. I have to admit that I am not the world’s best cook. I’m a very mediocre one that tends to mess up a lot of recipes that I attempt to recreate. Example: a pumpkin custard Martha Stewart pie I made last thanksgiving. It never set, because I obviosly did not do the custard part correctly. Soupy pie! Anyway, This recipe was awesome, because it didn’t call for a lot of ingredients that I didn’t have and its practically fool-proof. The only change I made was I served it on egg noodles instead of mashed potatoes. It’s so delicious and is now my go to dinner party dish. Thank you! I love it! This dish looks simply amazing! My mouth is watering. Well, hello. Don’t you look divine! I’m so making this soon – superb comfort food! Wow! I tried this last night and it was DEE-lish! Loved it. I tried to vote, but it appears the voting is closed. Thanks for a great dish. I’ll be making this again and again.